Fungus | Sommerberg Hotel Bad Wildbad, Herzlich Willkommen im Panoramahotel über dem Enztal! After a poor mushroom season last year up on the hill it looks like being a bumper one this year. There are already plenty to be found in various shapes and sizes and if you know where to look edible ones too. 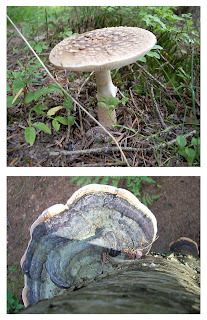 The image shows two different types found on the zigzag path yesterday between Sommerberg and Bad Wildbad.